The large selection of flora and fauna is only one example of diversity found in the vast Adirondack Park of upstate New York. The region also boasts one of the most interesting selections of cultural entertainment options found outside a metropolitan area. 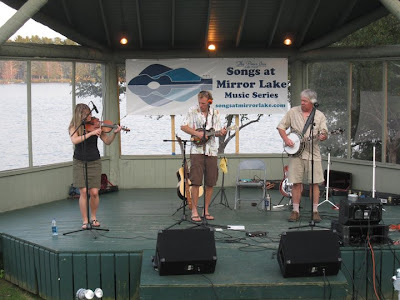 The summer concert series, The Pines Inn Songs at Mirror Lake, held at Mid's Park in Lake Placid, embodies the adage "variety is the spice of life." Last week's concert featured three professional musicians who played a selection of old-time folk and bluegrass. Lake Placid's resident musician/Olympic biathlete, Lowell Bailey kept things peppy with his superb mandolin and guitar playing, while Kester Hollrock dazzled the crowd with her smooth fiddle. Cascade neighbor John Doan's five string banjo and dobro work was simply a treat. Listening to excellent live music while surrounded by Adirondack eye candy is a combination that is tough to beat. The audience on the crowded hillside had a healthy representation of locals whose sense of post-Ironman relief was palpable. Here is the beginning of a slide show that I hope gives you a taste of this lovely Adirondack lifestyle. What's Next For Precocious Adirondack Bears? Why Do People Move to the Adirondacks?